Ryan Lambie from DenOfGeek.us praises Guillermo del Toro's world building; from Cronos (1993), Mimic (1997), The Devil’s Backbone (2001), Pan’s Labyrinth (2006) through to Pacific Rim (2013). In terms of world-building, Pacific Rim is arguably the most expansive movie del Toro’s yet created. Set in a near future torn apart by giant beasts which have, for reasons initially unclear, emerged from our oceans to wreck havoc on our cities, it sees a dwindling defense force gather together a handful of skyscraper-sized, human-driven robots to repel the incursion. Proudly inspired by Japanese giant monster movies and anime, Pacific Rim creates its own realm of fantasy logic. We come to accept the strange, majestic movements of these towering robots, whose limbs move in time with the pilots’ own. Like all of del Toro’s films, it communicates so much through images rather than words; Pacific Rim’s designers draw from the symbolism of World War II tanks and submarines to give the machines a rusted, battered, lived-in sense of history, while the screeching kaiju have their own unique markings and individual videogame-like killer moves. Like Mimic, Pacific Rim isn’t at all ashamed of its own inherent goofiness, and del Toro pulls off an impressive high-wire act of giving the movie both a sense of violent impact and also a childlike, playful sense of awe. It’s this child’s eye perspective, perhaps, that is also key to the director’s world-building. Not all of his films are literally seen through a child’s eyes (though several of his best are), but they are all invested with the same childlike fascination for minute details and exotic, surreal images. Take, for example, a location somewhere in China, where an ad-hoc city has been arranged around the gargantuan bones of a fallen kaiju. It’s a detail that is largely incidental to the plot, but it’s an idea that tells us so much about the history of this world without anyone uttering a word: the corpses of the kaiju are so utterly enormous that they’ve simply been assimilated into the landscape, and formed the part of a new and strangely beautiful place. Things like this abound in Pacific Rim, and if you take the time to see them, they add depth to a story that is constantly thundering along like an untethered beast. Look how the little blue highlight in heroine Mako Mori (Rinko Kikuchi) precisely matches the color of the coat she was wearing when she was almost killed by a kaiju as a child - a little bit of her traumatic past still clings to her as an adult. 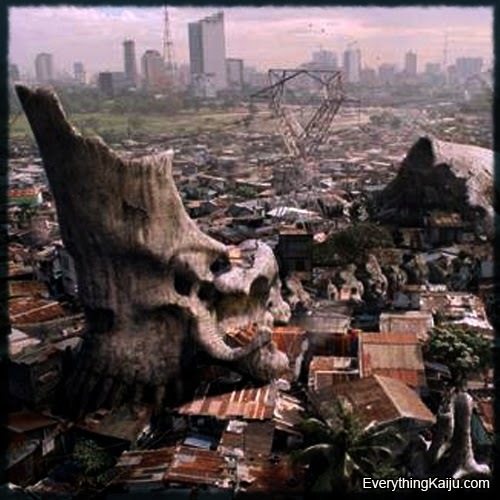 Continuing with the same theme, they take the kaiju skull city a step further by not only building around it, but by turning it into a temple.